The muscles of the arms, the flexors and extensors, are recruited during many upper body exercises such as the bench press and chin up. The arm muscles will receive a significant level of stress from a routine which is composed of compound exercises, even if there is no curl or triceps extension exercise in sight. For some the focus is placed on the exercises which integrate several muscle groups, involving the arm muscles during the exercise movement, whilst opting to leave the isolation arm exercises from the routine. For those who follow a training split and wish to directly target the arm muscles for maximum growth, we have composed an arm workout which should significantly stress the triceps, biceps and other arm flexor muscles. The French press is an overhead triceps extension using a barbell or an EZ bar (beneficial for those with injurious wrists). The lateral head of the triceps is targeted greatly during the French press due to the arms being stretched above the torso. Begin the exercise with a light weight, performing two sets of twenty repetitions to warm up the triceps and stabilising muscles. Due to the over head posture it would be wise to warm up the shoulder joint prior to the working sets. After thoroughly warming up, perform three sets of twelve repetitions for the working sets. Ensure sound posture is maintained during the lift, and the upper arms should remain stationary. A high pull cable is required for this exercise. If you are training at home, substitute this exercise for a laying triceps extension (commonly referred to as “Skull crushers”). The medial head of the triceps is specifically targeted during this exercise; although a variety of cable attachments are available to shift emphasis onto the other muscle heads. The EZ bar attachment may be a wise choice for those with poor flexibility in the wrist joint. Three working sets of twelve repetitions can be performed, with a pause at the bottom of each repetition at peak contraction. Ensure the upper arms remain fixed at the side of torso, and focus on a slow and controlled eccentric phrase of the repetitions. The triceps should be significantly tired from the two previous isolation exercises, leaving the close grip bench press as a finishing exercise to overload the muscle. Take a grip which is comfortable, commonly with each hand between six and twelve inches apart. As the bar is brought down towards the chest ensure the upper arms tuck down to the side of the torso, and avoid allowing them to flare outward. Perform three working sets of eight repetitions. It would be ideal to perform this exercise with a training partner to allow for maximum effort, training close to failure. 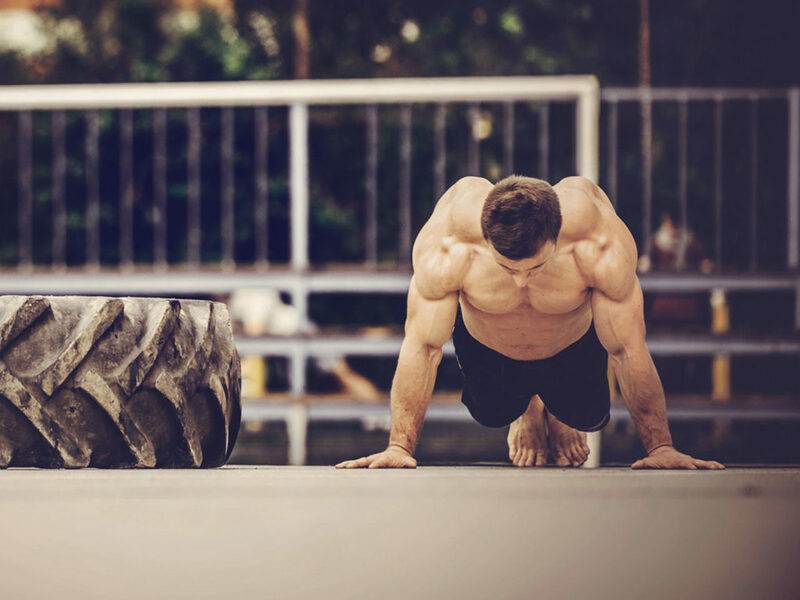 If you do have a training partner, end the last set with a few negative repetitions. The alternating biceps curl targets the arm flexor muscles effectively. Performing the curls in an alternating fashion allows for 100% concentration to be placed on each arm at a time, ensuring the unilateral training results in equal stress to both arms for equal progression. Begin with two warm up sets, performing twenty repetitions per arm. After the warm up is complete begin the working sets – three sets of twelve repetitions. The reverse curl targets the brachioradialis effectively, the muscle which runs from the forearm to the upper arm to aid in arm flexion. The EZ bar is chosen due to the favourable position of the wrist compared to the barbell reverse curl, in which many people may find less comfortable on the wrist joint. Perform the repetitions in a controlled manner, making full use of the eccentric phrase of the exercise. Perform three sets of ten repetitions. The preacher curl is an excellent exercise for totally isolating the arm flexor muscles. The exercise can be performed with a barbell, EZ bar or dumbbell. The preacher curl proves a wise choice for those wishing to totally exhaust the biceps whilst ensuring no additional muscles are aiding in the exercise. It has been documented that the long head of the biceps brachii (the outer region of the biceps) is placed under greater stress during the preacher curl, and we may therefore conclude that the preacher curl is a wise choice for those wishing to build the “peak” of their biceps. Realistically however, achieving peaky biceps is a lot more to do with the genetics of the trainer, and the shape of the muscle belly. Nevertheless, the preacher curl is a very effective exercise for targeting the arm flexors. Perform three workouts sets of twelve. Make the last set a drop set, where the set is performed to failure, and then a lighter weight is used again until failure, and again once more. The muscles will likely feel tight after training, with a notable “pumped” feeling and appearance. The moderate repetition range used is argued to be optimal for muscle hypertrophy, and the said “pumped” feeling is commonly experienced from moderate repetition training. The pump is actually anabolic (due to myofibrilar hydration), and the build up of lactic acid from moderate repetition training is also typically a precursor to a surge of powerful anabolic hormones. Simply, this = growth! It would be optimal to perform intense stretching post workout, with the aim of stretching the muscle fascia (the restrictive sack which surrounds the muscle belly). Consume your post workout shake (or meal) soon after completing the arm workout.